What on earth is Geoff looking at? It’s hilarious sometimes what you stumble across on the boys’ own image gallery on their iPads when you take the time to take a closer look. Take a look at this image of Geoff. Okay, granted, it’s not the most flattering image, but the question has to be asked, what is he thinking/doing? Aidan’s accidental portrait of Dad in unusual circumstances. Image taken by Aidan Hunter (we think)? 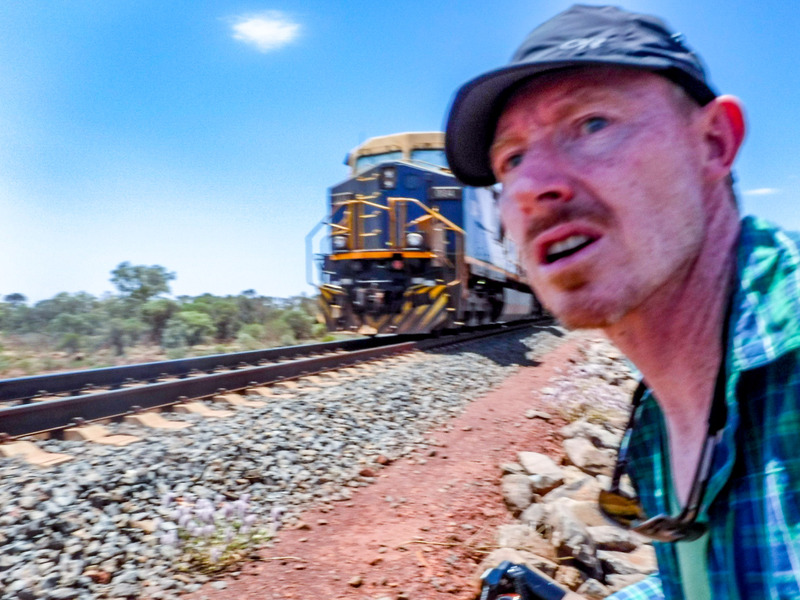 What has happened we think is an obvious “accidental photo” was triggered just at the right time by Aidan when they were scrambling up to get a closer look at an Iron Ore train heading through the Karijini National Park. But it begs the question …what on earth is Geoff looking at in this shot, and that face Lol? So let’s have a bit of fun with it – we want your comments, suggestions, anything really from our subscribers and visitors to post your thoughts as to what Geoff is perhaps doing here. We’ll think of a prize to send the funniest comment – not sure yet what, but we’ll think of something (hopefully) worthwhile. Thank you to all who made comments to this funny photo – we enjoyed reading all of them. As to the photo and in case you were wondering, it’s a balmy 40deg and the train has just passed us. These trains have locomotives on the rear of them as well as the front and centre of the length of the train. I am therefore looking in the opposite direction in which the train is heading and Aidan is directly by my left side a little “trigger-happy” on his iPad it would seem. Perhaps it was the heat! Celia! Get off the tracks, you’re no match for that ore train. Its obvious! Is there another train coming this way??! Oh my G..d! Is that an alien space ship, any minute now we are going to be ‘taken’ unless we get on the train and get outta here…boys boys, wife RUUUUNNNNN!!!!! I was always taught growing up; look to your right, look left and look to your right again before proceeding. But is this valuable life-lesson applicable to single-line railways? Anyway, a coooool prize beckons so keep the comments coming folks! Thx for Son and Gez for your thoughts so far! It’s those backpackers again with another busted tyre and there on the tracks! Is that an elephant on the track? Oh my God … its that Super Emu playing chicken again…! Lucy has an entered by email as she couldn’t attach her photo. Could it be? Blue telephone box on the tracks? Doctor?